BAS > News & media > How much carbon can polar seafloor ecosystems store? One of the best-known impacts of climate change is the loss of sea ice in the Arctic, but also in parts of the Antarctic: the poles are increasingly turning from white to blue. However, in the shallow seas near continental landmasses, the colour green also enters the picture: with the ocean ice-free for longer periods, the growing period for algal blooms also grows longer. These algae, in turn, provide food for seafloor-dwelling organisms, who use the carbon from their food to grow their bodies and shells. 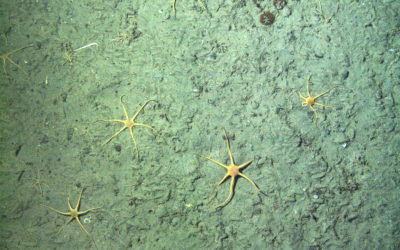 A new study by BAS marine ecologist Dr David Barnes, published in the journal Global Change Biology this month, aims to unpick the puzzle of how these seafloor communities – known as benthos – are responding to changes at the sea surface. 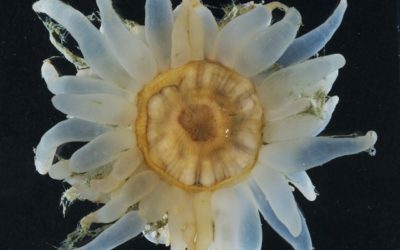 Understanding these ecosystems is important as many organisms use carbon to build their shells, storing it away in seafloor sediments when they die and removing it from the global carbon cycle for millennia. 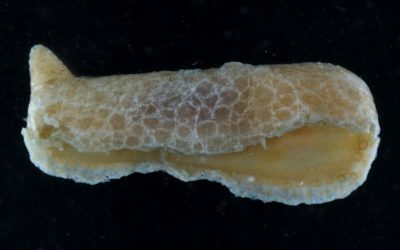 This means that if the benthos thrives, it can play a bigger role in offsetting emissions of carbon dioxide into the atmosphere. The ocean soaks up large amounts of carbon from the atmosphere, but its ability to absorb the increasing quantities produced by human emissions is limited. The role of polar seafloor communities in carbon storage processes is poorly studied, but it may turn out to be an important negative feedback mitigating climate change: as polar seas become ice-free for longer periods, algal blooms have a longer growing season. They therefore provide food for benthos communities throughout a larger part of the year, enabling them to store more carbon and preventing it from returning to the atmosphere. The timing and location of ice loss matters: crucially, most of the sea-ice loss in the Arctic and in West Antarctica has taken place in shallow, ecologically productive seas. As a result, most of the newly ice-free area is shallow enough to be abundantly colonised by carbon-storing benthos. However, the decline in sea ice also has a downside: large icebergs, calved from land-based glaciers flowing to the sea, are now frozen into place for shorter periods and can move around more freely. And while sea ice is usually just a few feet thick, the bottoms of icebergs can reach hundreds of meters down into the ocean. As the icebergs are moved by currents, tides and winds, they often scrape along the seafloor and can destroy large swathes of seafloor ecosystems. 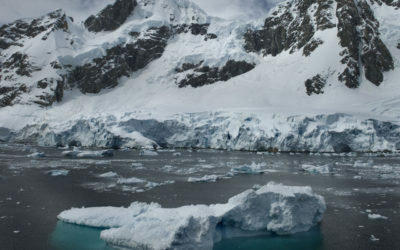 Dr Barnes investigated the impacts of iceberg scouring and longer growing seasons for algae in shallow seas of the western Antarctic Peninsula, using data collected at Rothera Research Station and from RRS James Clark Ross over two decades. 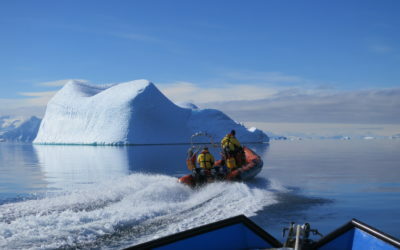 He found that icebergs scour very shallow seas – just a few metres deep – particularly frequently and that the ecosystems here are more likely to be disturbed. Diving operations under the sea ice near Rothera Research Station. In contrast, in waters up to a few hundred meters deep, fewer icebergs are large enough to reach the seafloor. In these areas, the length of the ice-free period is the most important control on carbon storage by seafloor organisms. Studying seafloor ecosystems is difficult because satellites cannot penetrate the water far enough to observe large areas. Diving remains a crucial way of collecting data, so the areas that scientists can survey are relatively small. 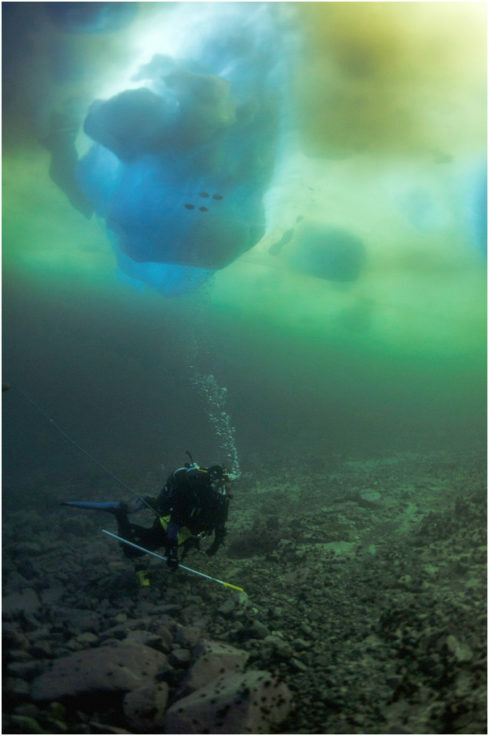 As such, more data from the Antarctic as well as the Arctic – which remains very poorly studied – will help us understand how much carbon polar seafloor communities can store on a global scale. The paper “Polar zoobenthos blue carbon storage increases with sea ice losses, because across-shelf growth gains from longer algal blooms outweigh ice scour mortality in the shallows” is available at onlinelibrary.wiley.com/doi/10.1111/gcb.13772/full.